South Adelaide are set to host North Adelaide at Hickinbotham Oval this Saturday - League 2:10pm, Reserves 11:25am; Adult $14, Concession $8, Under-18s FREE. The Panthers can reclaim top spot on the SANFL IGA ladder with a win against the Roosters and will be eager to atone for two subpar showings in the previous two rounds. The last time the two teams met, the Panthers ran away comfortable winners 13.8 - 86 to 2.9 - 21. However, under the tutelage of new senior coach Josh Carr, North Adelaide will not be the easybeats they have been in previous seasons, with the former Power hard nut instilling new belief and toughness into his charges in 2016. Brad Gotch's team will be boosted by the inclusions of League regulars Brad Crabb and Daniel Bass, who return to the side after serving suspensions for striking, while excitement machine Emmanuel Irra and young gun Ben Heaslip have also been named on an extended bench. Sadly, Tarak Redigolo will be missing from the team sheet come Saturday afternoon after succumbing to a knee injury suffered against Port Adelaide that will see him miss the remainder of the 2016 season. Meanwhile, this Saturday also marks the 100th League appearance for hard-running utility and Panthers cult figure Jake Veide. In the Reserves, 'Two Metre' Peter Steffe returns to ruck duties for Adam Blakely's men after two solid weeks with the seniors, while Nathan Daniel is set to work his way back from a knee injury in the twos. This weekend is also the start of the 'Multicultural Month' initiative in the SANFL. The Panthers - with a host of multicultural players on their list, including; Adam Gulden (Turkey), Emmanuel Irra (Uganda), Ben Darrou (Morocco) and Pan Kokkinakis (Greece) - will celebrating the diversity of the Southern Community and the competition on the day. South Adelaide have enjoyed a strong start to the year and are undefeated in Noarlunga this season, but are coming off of two disappointing losses and need the support of the blue and white faithful to cheer them back into the winner's list. Get to Hickinbotham Oval on Saturday and get behind the boys as they look to reclaim top spot on the ladder! 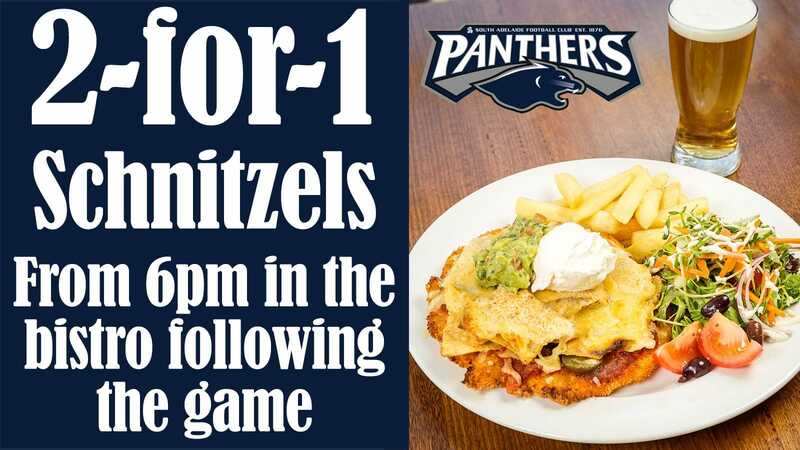 Following the game Presentations will be held in the Jimmy Deane's bistro, with 2-for-1 Schnitzels available from 6pm. But remember if you cannot make it to Hickinbotham Oval on the weekend to download the SAFC App for live scores, stats and radio call of the game against the Roosters! The SAFC App is available for free download from both the App Store and Google Play. Or hit the Mixlr player below for live commentary on the day.